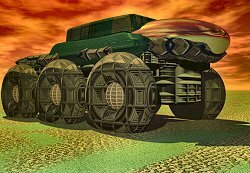 This is a render I did of an ATV groundcar. For specs i used the writeup of the Grizzly model ATV groundcar from the Arms & Equipment Guide. These things are ridiculously fast. Imagine off-roading at 120 miles an hour!